50 YEARS and STILL COUNTING! 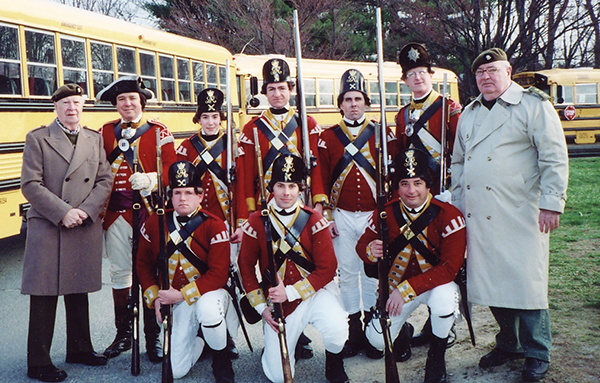 When I was in fourth grade a friend and I, along with our fathers went to the Patriots' Day reenactments. As fourth graders, we were so intrigued! We loved it so much, that it became a yearly tradition, waking up at two in the morning, driving to Lexington , and watching the battles. Eventually, my friend joined as a fifer and pulled me into the hobby later as a bugler. Why did you stay in the Regiment? Although I say I have been in the 10th Regiment since 2001, from 2006 to 2010 I took a hiatus from the hobby while I was in college. What pulled me back was the excitement of battles, camaraderie and sense of family that the people in this group share, and educating others about history in a non-standard way. And those are the reasons that I stay a part of this group to this day. In real life I'm an elementary school teacher, where being a reenactor is an added bonus. I love going into my school in uniform and seeing the looks on my students' faces. It makes me so happy when I see my students at events, learning and being excited about history. Outside of the 10th you can find me at a Bruins' game, reading a good book, and spending time with my family and friends. In the late 1960s, men and women flocked to the colors in order to celebrate the upcoming bicentennial of the American War for Independence. Town after town in eastern Massachusetts and southern New Hampshire re-established long dormant town militia and minute companies. They began to stage mock battles with "British regulars." In March of 1967 at the old North Bridge in Concord a local historian/photographer watched in amazement as bathrobe cloaked "regulars" in paper mache grenadier caps tried to emulate the Crown Forces troops. That man was Vincent J-R Kehoe and he was determined " ...to produce a British unit that would appear in the field as (he) opined a British soldier of the year 1775 looked. It was to eliminate the red paper cardboard caps, the musical comedy uniform coats, and the un-uniform appearance of those who had played the role of the British in that pageant-playlet that stirred (his) thoughts to hopefully better things." 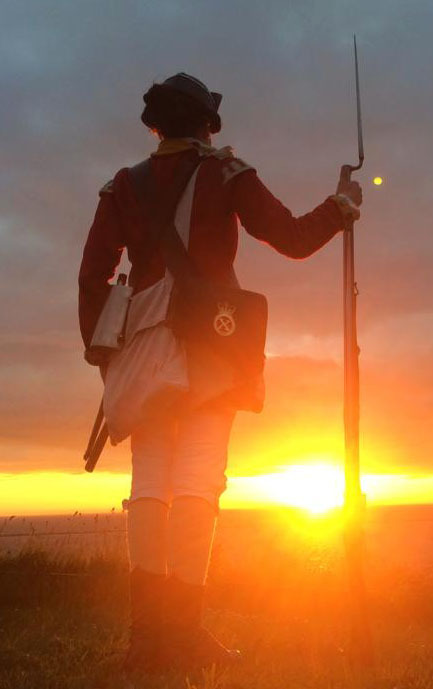 He knew that many regiments of regulars were garrisoned in the Boston area in 1775, among these were the 4th Foot, 5th Foot, 10th Foot, 23rd Foot and the 64th Foot. Having served in the 10th Mountain Division during WWII, Kehoe picked the 10th Regiment of Foot as the Regiment he was interested in establishing. With the help of two retired British officers, Major Nick Dawnay and Major-General Sir Christopher Welby-Everard KBE CB DL, Kehoe began several years of researching the history and uniforms of the 10th Foot. Sir Christopher was the president of the 10th Foot Royal Lincolnshire Regimental Association and formally authorized Kehoe to establish His Majesty's Tenth Regiment of Foot, American Contingent on July 15, 1968. On January 6, 1970 Kehoe recieved his commission as "Colonel of the Tenth Foot" from the regimental association. 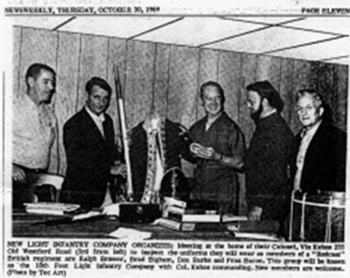 The first organizational meeting of the American Contingent was held on April 17, 1971 and from that meeting was born the first company of the Tenth Foot, the Light Infantry Company. The first uniform worn by Col Vincent J-R Kehoe on April 19, 1970 as a Light Infantry officer is shown on the right. Over the next few years every element of this uniform and its accoutrements have been changed or refined reflecting new information that became available from research conducted by Col Kehoe. By 19 April 1972, The American Contingent had grown to two companies, Light Infantry and Grenadiers as well as a Company of Music. By 1975, the Regiment added a Battalion (aka. Hat) company to its ranks, which had swelled to over 100. 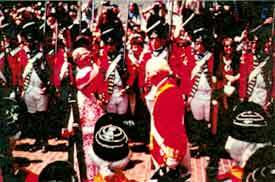 On July 11, 1976, the Regiment, under the command of Col Kehoe, acted as Guard of Honour for Her Majesty Queen Elizabeth II, in Boston, Massachusetts during the Royal Visit. In the autumn of 1976 the regiment traveled to England and put on ceremonial parades in Lincoln and London. 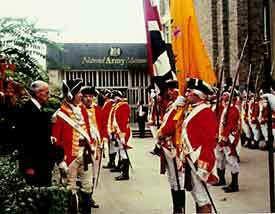 The regiment paraded in Lincoln Castle on October 1, 1976. Sobraon Barracks in Lincoln housed the 2nd Battalion of the Royal Anglian Regiment, which was made up, in part, of the old Lincolnshire Regiment which evolved from the 10th Regiment of Foot. 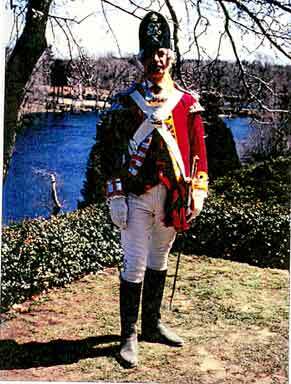 In 1978, Col Kehoe retired from the Regiment and the name was changed to His Majesty's Tenth Regiment of Foot in America. Currently, the 10th Regiment consists of 3 companies of uniformed soldiers: Grenadiers, Light Infantry, & Colonel's (Battalion); a company of Music; and a Corps of Civillian Volunteers. (See the Regimental Structure page for a desription of each.) 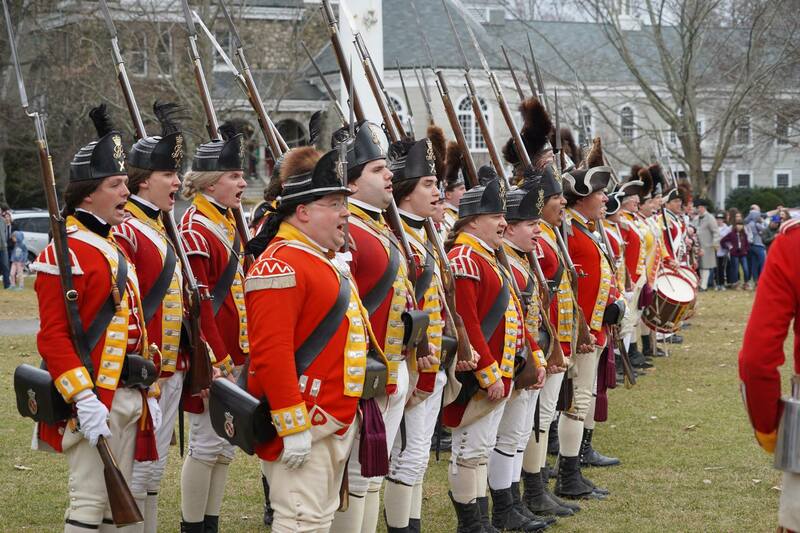 The Regiment still measures its growth, progress and appearance to the standards of April 19, 1775 as this is always the first day on the field at Lexington Green and Concord's North Bridge. Col. Vincent Kehoe (far left) returns for Battle Road 2000. In the fifty years since the Regiment’s founding, the living history hobby has grown and evolved exponentially. Visitors to a living history event today will see a wide variety of “impressions”; the military units, geographic regions, and even the years that living historians choose to portray vary greatly based on member interest and levels of commitment. Although these differences often lead to conflict and disagreement, the 10th believes that such differences can help foster discussion, growth, and education, both between living historians and between living historians and the public. The 10th considers itself to be “progressive” within the living history hobby; we research, self-examine, reflect, and adapt, in order to provide the public with as authentic an experience we can create with current research and resources. The impression a particular group chooses to portray-a New Hampshire militia in 1776, a British light infantry company of 1780, or a band of Native American allies-is based on all of this extensive research. As living historians, we examine not only weapons, uniforms, and battle tactics, but politics, religion, foodways, daily life, and more, in order to provide as full a picture as possible. For some groups, the never-ending quest for authenticity means entirely hand-stitched uniforms and equipment, primitive sleeping arrangements, and a male-dominated rank and file. While the 10th strives for authenticity, we also believe in striking a balance between period-correct experiences for our members and visitors, and modern conveniences and considerations. One of the 10th’s biggest strengths - our ever-growing membership - is also a weakness in terms of authenticity. This becomes especially apparent in the way we set up our camp kitchen and cook our meals. Historically companies of men, or even smaller sections, would have been expected to cook for themselves in the field and while on campaign, with very little cooking equipment. Each man was provided rations by the army, and these rations would have often been combined to make soups, stews, or other meals that could be stretched to provide nourishment to several men. Meals revolved around seasonality and the availability of certain food items. Soldiers might have relied on the kindness of local residents and farmers, as well as markets in larger towns and cities, to supplement their rations while on the march. Today, while we keep seasonality in mind, it can be difficult to relegate cooking to individual companies or sections when reenactment schedules are often packed and cooking experience varies greatly. For this reason, the 10th chooses to prepare and cook meals for the entire regiment, with quite a bit of cooking equipment and dining flies for shelter. There is a historical backing for this choice as well. 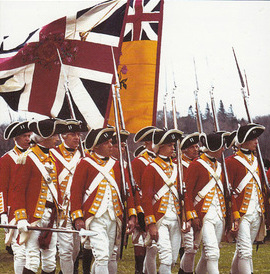 While some groups choose to portray the later years of the war, when regiments would have stripped themselves of extra equipment and long baggage trains, the 10th portrays 1775. Historically, when the 10th arrived in Boston in 1774, they had not fired their muskets in aggression for almost 70 years. A garrison regiment, the 10th would have only been familiar with large communal meals in a defined space within a fort or barracks. Early in the war, the British army was like a moving city, and wagon trains of baggage, equipment, and supplies could be a mile long behind the marching army itself. Our growing numbers make it easy for us to portray this aspect of the early years of the war, and allow visitors to living history events to draw comparisons between groups and see the evolution of the British army through the war years. Our camp also includes rows of simple white tents, as opposed to lean-tos, brush huts, or other primitive shelters that the army adopted in the later years of the war. While each tent would typically house 5 or so men with nothing to sleep on besides straw and wool blankets, our modern-day members have the option of an individual, private sleeping space, as well as a space to hide modern conveniences such as sleeping bags and cots. While some of our membership choose to use more period-correct sleeping arrangements, we understand that not everyone can or wants to, and we allow members to make that decision. We also, when given the opportunity, will use more period-correct spaces for cooking, sleeping, and daily activities. Forts are especially good for this; members of the regiment have slept in period guardhouses and cooked over a hearth on more than one occasion. Similarly, the 10th makes an important modern concession in who it allows to join its ranks. In the 18th century, women did not join the army; it was an unacceptable position for a woman to be a soldier. While there are a handful of documented examples of women “passing” as men and joining the Continental army (the most famous being Deborah Sampson) or participating in battle on rare occasions, as well as isolated incidents of frontier women taking up arms to protect their homes, there are no such documented examples in the British army. The concept of disguised women was not unfamiliar to people of the time, however; there are numerous songs of the 17th and 18th centuries that tell stories of female soldiers and sailors. In the modern day 10th, we have several disguised women in our ranks, serving as musketmen and musicians. These are not women in uniform; there is a requirement that female soldiers will be able to pass as men on the field. For some groups, women may only join as camp followers, who historically could have been soldiers’ wives or refugees who quite literally followed the army and lived in camp with the men. However, the 10th believes that while authenticity in appearance is important, it is equally as important not to discourage anyone who has a passion for history and education and who can put in the time and effort to fully join the ranks. Our female soldiers are frequently asked “did women really fight back then?” and they are all happy to answer. There is much that goes into this hobby, and in the years to come, the 10th and other units may find themselves changing and evolving even more based on new findings and research. We are always happy to answer questions, share our research, and educate, whether it’s at a school, museum, or historic site. The thoughts expressed here are meant to address just a few aspects of how we operate and why, and foster further discussion. © Copyright , His Majesty's Tenth Regiment of Foot in America. All rights reserved.